This complex was setup by Tibetan refugees in Darjeeling on October 2, 1959 after they followed Dalai Lama and escaped from Tibet. The refugees adopted the principle of self help so that they could become self-independent and completely rehabilitate themselves in a foreign country, which they did gracefully. They received the site "Hill Side" measuring some 4 acres of area from the state government to build the center. It's located on a hill top that can be approached from Lebong Cart Road by car. Initially they started raising funds through donations, subscriptions, charity shows and even through exhibition soccer match. Soon they started receiving some funds from domestic and international voluntary organizations as well. A committee with 10 members was formed that was responsible for the development and management of the center. Ms Gaylo Thondup was the first President of the center. One of the prominent members of the first committee was Tenzing Norgay who climbed the Everest in May 1953 with Edmund Hillary. A small center that started with only 4 workers with the objective of self rehabilitation and helping the under-privileged Tibetan community in the area, has now grown to accommodate more than 650 Tibetan refugees. You will see Tibetan men and women making exquisite hand crafted items like woolen shawls & carpets, carved wooden crafts, leather jackets, coats and lots of other items. They have a training center that imparts skills to the new workers. Production of handcrafted items is the main activity of the center and its earning source. They export the items to as many as 36 countries all over the world. If you like to buy some items, you can get them at the Show Room, which is an outlet located in the premises. As you enter the center through the main gate and walk around, you will see the various handicraft sections around the periphery. These are all housed in single storied red colored tin shacks. The first section is the Tailoring and Leather Works, followed by Knitting and Painting section, Wood Carving section, Apron section, Carpentry and such. At one side of the complex is the Show Room or the retail outlet. Here you will see all the hand crafted items on sale. There are many ladies jackets, carpets, gloves, woolen aprons, bags, various types of curios, small models of Buddha, cards, pouches, carved wooden items, hand painted scenery and pictures of Tibetan women on cloth pieces, and many other items. There is a small counter where two Tibetan women help with the transactions. There is a board that says "Fixed Price" which essentially means no bargaining. A Hindi music usually plays here in the background. Opposite to the outlet is the Photographic Exhibition Hall. Here you can see black & white photographs of early group of Tibetan refugees, children receiving donated clothes, pictures of aid distribution like blankets, early pictures of Tailoring & Leather section etc. There is also a photograph of former Prime Minister Rajeev Gandhi who visited the center along with Sonia Gandhi after their marriage. You will also see pictures of Royal Greek Visitors of 1966 like that of the Queen and the Princess. Then there is an interesting photo of "Khapse" which is a deep fried cookie prepared during 'Losar' which is the Tibetan New Year. These cookies are also known as Donkeys Years because of their shapes. They are relished as snacks during the New Year. Adjacent to the Photographic center in a dark grey colored building there is a crèche where the kids are taken care of during the day time when their parents are working at the various handicraft sections. Next to that is a small store called Hill Top Store selling miscellaneous items like candies, biscuits, cold drinks, chips etc. Upstairs there is a Tibetan Refugee Computer Center which holds regular classes in the mornings for those interested from the Tibetan community in the area. The "Hill side" center is the main unit and is known as the factory complex. They also have a Head Office at Gandhi Road in Darjeeling Town center and several other operations. As part of their welfare program, the center also runs a 20 bedded hospital. They have an X-ray and a Pathological clinic at their office premises. A dental clinic was opened at the Head Office premises in October 2000. All these units cater to people in need from surrounding communities. One of the latest additions is a Mobile Clinic which is a huge van equipped with modern medical amenities like ECG, Ultrasonography, Radiography and lot more. 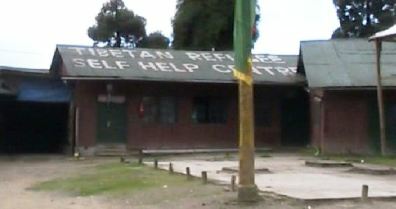 The center also runs a small school free of cost for the poor Tibetan children in Darjeeling. 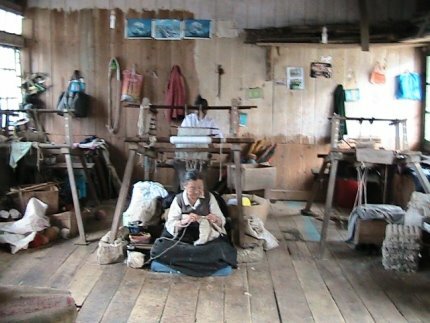 The factory of the Tibetan Refugee Self Help Center where the all the handicraft items are made, is located at a place known as Hill Side. From Lebong Cart Road opposite to the Rangeet Valley Tea Estate, a narrow steep road on the right goes uphill. This winding road leads to the center. From Darjeeling town center, it takes about 20 minutes to reach the center by car. Check out Darjeeling Map to see the location. Monday to Saturday, 9am to 4:30pm. Closed on Sundays. Last year we were in Darjeeling and purchased several rugs at the Tibetan Refugee Center and would like to purchase more. We are unable to find the same type of rugs in California and are happy to purchase them from the center and pay for postage. Could you get us in touch with someone that could help us find rugs from the center. Hi, You will find the contact information in my website under "Tibetan Refugee Self Help Center" at the bottom ... they don't have published email address. My husband and I are seriously thinking of taking a few months off to work pro-bono, as volunteers. We both know Darjeeling because years ago travelled to India and stopped by Darjeeling. We would like to contact the Tibetan Refugee Self Help Center to see if they offer the possibility of doing volunteering work at the Center. The problem is that the two mail addresses I got on the internet don't exist any more, so I need the current email address in order to contact the Center. Can you provide me with the email address? Thank you very much.